Crêpe, embroidered velvet in mercerised embroidery cottons, lined with silk. Anna Buruma, Liberty archivist identified the silk of the underdress as Liberty 'Nitas' silk, from a swatch book held at the Liberty archive on 15 June 2017. This type of dress was seen as the healthy and aesthetic alternative to the corseted and constrictive fashions in conventional dress. Falling from the shoulders, it does not restrict the body and it skims lightly over contours that would normally have been shaped by a boned under-garment. Loosely based on medieval attire, the dress has four panels that gently flare to a trailing hem and train trimmed with velvet. The separate long, tapering tabard has fly-away shoulders and is held loosely at the waist with a crêpe band. The crêpe is similar to those made by Liberty's, the London fashion shop. Liberty's sold a wide range of lightweight silks in soft plain colours that were ideal for artistic clothes such as this. The harmonies of muted grey, mauves and purples are typical for this period. 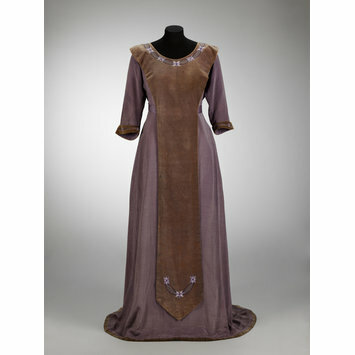 Dress of deep lilac silk crêpe and tabard of embroidered velvet in mercerised embroidery cottons and lined with silk. Embroidered with a floral design. Possibly made using materials from Liberty of London. Madame M Forma is listed as a dressmaker (not court dressmaker) in the 1911 London Post Office Directory at 40 Conduit Street. She is not in the 1902 edition. No others checked as yet.